This photograph was taken on 7 October 1914, when six German emblems were transferred to the Invalides. Carried by gendarmes, some of the flags were torn during the fighting. Those carrying emblems are flanked by other marching gendarmes bearing a Lebel rifle. Civilians surround the procession and all the men have a joyful or determined expression on their faces. By the way, it can be noted that the men of the time did not go out without a hat: kepi, boater, Fedora, etc. 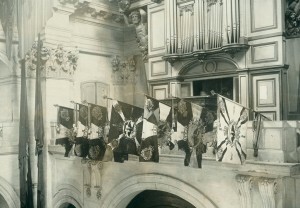 Here are seven German emblems fastened to the gallery of the church of Saint-Louis des Invalides, in front of the massive organ. 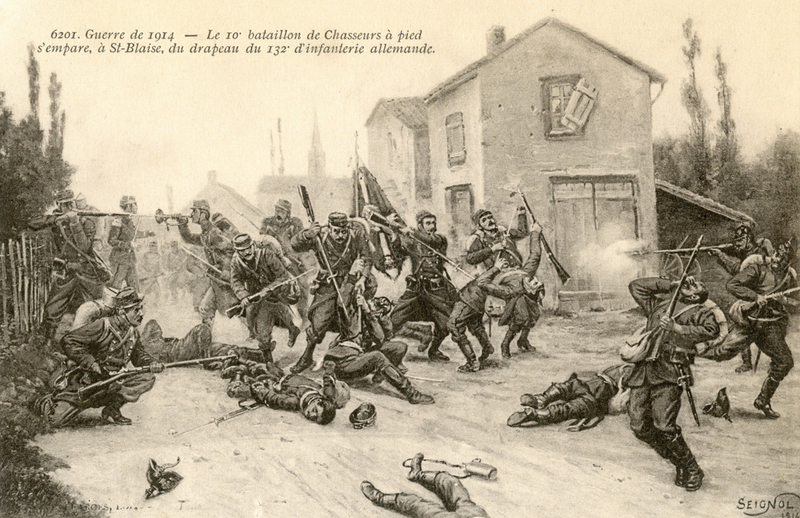 The first one was captured on 17 August 1914, at Saint-Blaise in the Vosges, from the German infantry regiment No.132 4th battalion, by the 1st battalion of Light Infantrymen. By the time it arrived at the Invalides on 18 September 1914, it had made the headlines of the Excelsior newspaper a month earlier. 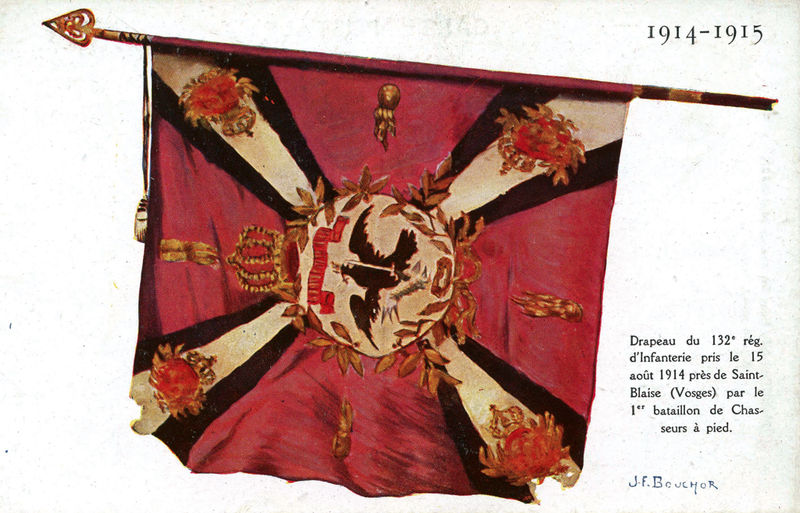 A large number of photographs of these emblems, symbols of victory, were taken, and their picture was widely circulated in the press, as well as in postcard form (in black and white, sometimes even in colour). These emblems were transferred to the great hall of the Invalides on 19 February 1915. 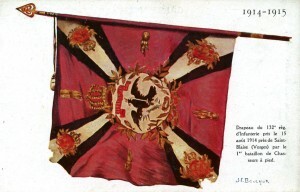 Up to the 19th century, flags and standards were markers for each army which enabled them to identify their units. Capturing the enemy’s emblems was a means of proving that it had been overcome. 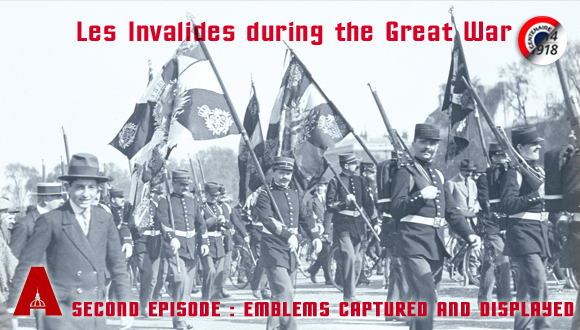 During the First World War, even if the emblems were still in existence, they were hardly ever used on the battlefield, particularly after the end of the war of movement which took place on the Franco-German front in November-December 1914.